Tonight, 16th July, 2018 through 8pm BST, we begin a series of three Crystal Earth Meditations to heal the Earth's energy field. The next two meditations will follow at the same time on Monday the 23rd and 30th of July. 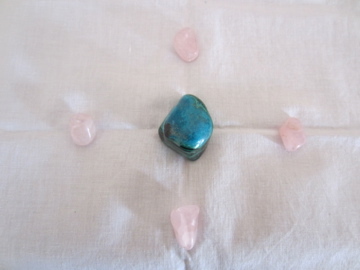 This meditation will use chrysocolla malachite and rose quartz crystals as shown below. Thank you to all for your continued connection and support in healing our beautiful, yet energy challenged planet. Tonight, through 8pm BST, we have the third in our series of Peace Meditations. The focus this week is for all across the globe suffering from a sense of loss. Once again we shall use a beautiful 'Pure Peace' set as shown below. All are welcome to join us from where ever they are based by simply visualising the crystals in meditation, positive thought or prayer through the allotted time. These meditations are a powerful way of helping others in need, and each person connecting helps to strengthen the healing the crystals can bring.